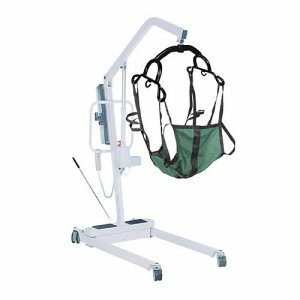 Electric Patient Lift with Rechargeable Battery. This electric lift by Drive Medical charges quickly and easily from an AC outlet thanks to a convenient non-removable rechargeable battery. The battery can be charged by plugging in the unit, and never needs to be removed. (The lift will not operate while plugged in.) Heavy gauge construction and a jumbo actuator pump that lowers the patient ensures safe repositioning. The pump even includes an emergency button and can be switched to manual mode. Two features ensure you won't misjudge the product's battery life: an audible warning will alert you once the battery power falls below 50% and a "CHARGE" light will automatically shut off when the battery is fully charged. The unit comes with a foldable mast and a wide, stable base for easy storage and transportation, making it ideal for homecare, and is for use with 4-point and 2-point slings. The lift features a weight capacity of 450 pounds and is protected by a limited lifetime warranty. 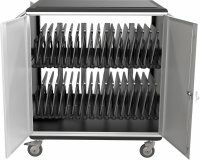 Boom (Height): 27.5"-76"; Base Opened (Width): 41"; Base Closed (Width): 15"; Base (Height): 4.5"; Base Clearance: 2"; Casters: 3" Front/4" Rear; Product Weight: 106 lbs.